Due to the health and economic benefits of breast milk, the World Health Organization (WHO) recommends that for infants who cannot receive breast milk from their own mothers, the next preferred option is donated breast milk. This recommendation is however rarely practiced in most developing countries where donor milk is not widely accepted. 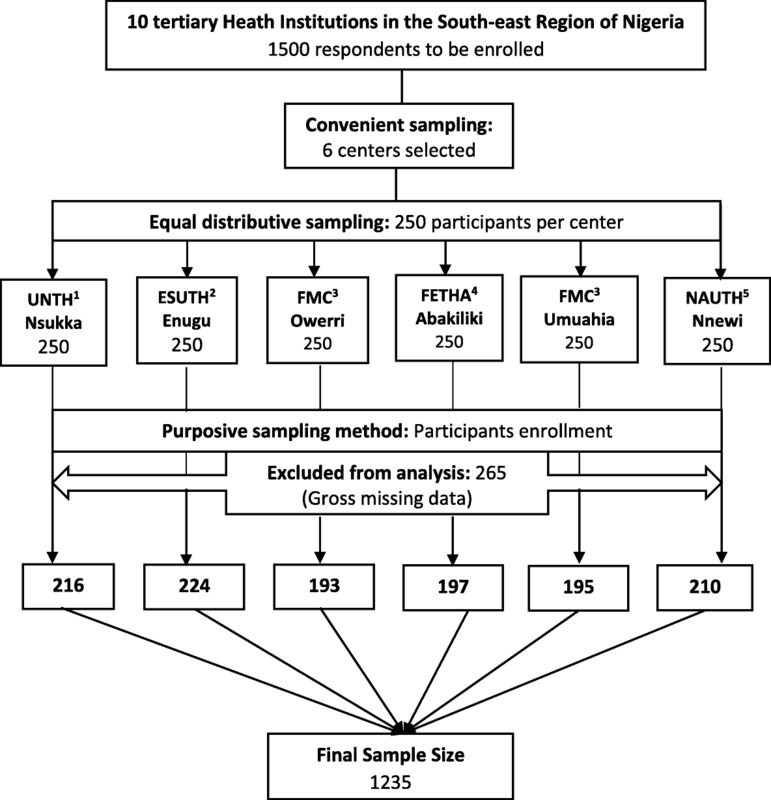 This cross-sectional multi-center study enrolled mothers attending antenatal or pediatric clinics in six tertiary institution in south-east Nigeria using purposive and convenient sampling method. Data collection was done using pretested questionnaires. The study aimed to assess the knowledge, acceptability and willingness to donate breast milk and/or use donated breast milk for their infants It also explored factors that determine this behavior. A total of 1235 mothers participated; 39% (480/1225) have heard about the concept of donor milk, while only 10% (79/759) and 7% (81/1179), respectively, had adequate knowledge of the concept and policy on donor milk. Sixty percent indicated willingness to use donor milk or donate breast milk if need arises. Respondents with lower age (p = 0.049) and with higher occupational status (p = 0.001) were more likely to have adequate knowledge of donor breast milk, while respondents with lower educational attainment (p = 0.002) and those who are non-Christians (p = 0.004) were more likely to request financial inducement for donating their breast milk. Adequate knowledge of the concept of donor milk (p = 0.001), preference of donor milk to infant formula (p = 0.001) and requirement of financial remuneration (p = 0.001) were the only significant predictors of willingness to donate and/or receive donated breast milk. The knowledge of the concept of donor breast milk and awareness of policies regulating its practice in Nigeria is low, but the prospect of its acceptability is high among mothers surveyed in south-east Nigeria. Targeted public education by relevant government agencies in collaboration with clinicians, community and religious leaders about the concept of donor breast milk to families may help increase the acceptance and practice of donating breast milk and/or use of donated breast milk among mothers in the region. Breastmilk has been well-established as the most optimal source of nutrient for infants particularly in the first six months of life . This is partly because it contains bioactive substances that are essential to the development of the newborn’s immature immune system. This singular attribute of breastmilk makes it even more important for the preterm and/or low birthweight newborn whose weak immune system is vital for its survival. Apart from the immune system, other long-term benefits of the use of human breast milk in preterm is well documented. These include but not limited to decreased incidences of retinopathy and necrotizing enterocolitis of the newborn, better neuro-cognitive development and lower risk of development of childhood obesity and diabetes [2–4]. It has been noted that newborns most susceptible to morbidity and mortality are those at greatest risk of not receiving the lifesaving benefits of breast milk . Based on the benefits, the World Health Organization (WHO) recommends that all mothers should feed their infants solely with breast milk, exclusive of any other nutritional sources for the first six months of their infant’s life . The recommendation further states that for infants who cannot receive breast milk from their own mothers, the next preferred option is donated human breastmilk. Donated breastmilk according to the National Institute of Health and Clinical Excellence (NICE) is breast milk expressed by a mother that is then processed by a donor milk bank for use by a recipient that is not the mother’s own baby . The use of donor breastmilk over infant formulas in vulnerable newborns has been shown to significantly impact on neonatal mortality rates in countries around the world. In Brazil for instance, there has been a drastic reduction in neonatal mortality by a whopping 73% between 1990 and 2013, since it incorporated milk banks into its newborn health policy [8, 9]. Unfortunately, most developing countries with the highest burden of global neonatal mortality lag in the implementation of donor breastmilk as the best alternative for vulnerable infants. In Nigeria, it is estimated that of the seven million children born every year only about 25% are exclusively breastfed from 0 to 6 months of age . Sadly, this poor practice of breastfeeding has to a certain degree been implicated in the current high rate of neonatal morbidity and mortality in the country . Even more worrying is the fact that there is currently no human breastmilk bank in the whole of the west Africa sub-region. Due to strong religious and cultural belief system, establishing human breastmilk bank in these settings for use in precarious situation where maternal milk is limited or not available such as prematurity, low birthweight or orphaned newborns requires an in-depth consideration of the acceptability of the concept by mothers in these settings. There is little discussion in local medical literature regarding the knowledge and willingness to use donor breastmilk among mothers in many developing communities. This study therefore sets out to assess the perception of the concept of donor breastmilk among mothers in several communities in south-east Nigeria. It further evaluated the factors that determine the willingness to participate in donation and/or use of donor breast milk among these mothers. This cross-sectional multi-center study was conducted concurrently over a six months period between August 2016 to January 2017 in six different tertiary health facilities namely the University of Nigeria Teaching Hospital (UNTH), Enugu, Enugu State University Teaching Hospital (ESUTH), Enugu, Federal Teaching Hospital Abakiliki (FETHA) Ebonyi State, Federal Medical Centre Owerri, Imo State, Federal Medical Centre Umuahia, Abia State and Nnamdi Azikiwe University Teaching Hospital (NAUTH) Anambra State. Each of these hospital offers specialized medical services and serves as a referral center to primary, secondary and private health facilities from within and outside their respective state. These six tertiary health institutions are all located in the south-east area of Nigeria and were chosen out of the 10 tertiary institutions in the region using convenient sampling method. This was based on the presence of one or more authors of this work being a staff in the institutions and/or supervisor(s) of the data collection team. The study aimed to enroll two hundred and fifty mothers attending antenatal and postnatal clinics in each of the selected center using purposive sampling method. A structured pre-tested questionnaire was administered by self and/or interviewer-based supervision depending on the educational abilities of respondent. All women who were pregnant or breastfeeding or have a child that is less than one year attending the antenatal and/or pediatrics clinic in the various study centers were included in the study while mother with children one year or above and those who refused to give consent to participate were excluded from the study. The sample size was calculated using a single population proportion formula with 95% confidence level, exclusive breastfeeding rate of 25% in Nigeria  and a non-response rate of 10%. This gave a minimum sample size of 317. To enhance the power of this study, we aimed to enroll 250 mothers from each of the 6-study site giving a working total sample size of 1500 respondents. The study variables were collected into the relevant sections of the questionnaire. In the first section predictor variables which included sociodemographic features of participants were collected and categorized as follows: i) Respondents age in years categorized as, < 20, 20–29, 30–39 and ≥ 40 years. ii) Educational level of respondents categorized as primary education or less (≤ 6 years of education), completed secondary (6–12 years of education) and post-secondary education (> 12 years of education). iii) Respondents occupation was categorized as unemployed (i.e. house wives, students etc. ), unskilled (i.e. petty traders, cleaners, hairdressers etc. ), semi-skilled (clerical secretaries, teachers etc.) and skilled (doctors, bankers, accountants etc.). iv) Socioeconomic class of respondent was calculated based on maternal education and paternal occupation using a scale  developed and validated for Nigeria and other developing setting and categorized as low, middle and high. v) Religion of respondent was grouped into Christianity, Islam, Traditional and others. This was further re-grouped into Christians and non-Christians. vi) Respondents tribe was classified into Igbo, Hausa, Yoruba and others for minorities tribes. vii) Marital status was categorized as married and single. viii) Spouse age was categorized as < 30 years, 30–39 years, 40–49 years and ≥ 50 years. ix) Spouse education was primary education or less, completed secondary and post-secondary education. The second section of the questionnaire collected information on outcome variable that measured parameters that assessed respondents’ attitude towards donor breast milk. Donor breast milk was defined based on the NICE clinical guideline . These parameters included i) If respondents have ever heard of the concept of breast milk donation (categorized as yes or no). ii) Knowledge of the concept of donor milk (categorized as none, partial and adequate). iii). Awareness of policy on breast milk donation was categorized as yes or no based on the knowledge of section 2.2.4 of the policy that states that for motherless and/or adopted infants’ relactation of a wet nurse (a foster mother or caregiver) who is HIV negative shall be encouraged and such wet nurse shall be encouraged to remain HIV negative throughout the period of breastfeeding . iv) Willingness to donate or receive donated milk (categorized as yes or no). v) Requirement of monetary remuneration for donating breast milk (categorized as yes or no). vi) Requirement of spousal consent before receiving or donating breast milk (categorized as yes or no). vii) Milk preference in serious medical conditions when own breast milk is contraindicated or impossible (categorized as donor breast milk and infant formulas). viii) Recommendation of donor breast milk to babies of other mothers (categorized as yes or no). See Table 1. Data collection was done using questionnaires administered by self and/or trained research assistants. Information were inputted into the relevant sections of the questionnaire and subsequently transferred into a Microsoft Excel Sheet. Distribution of the sociodemographic characteristics of respondents (predictor variables) and parameters related to perception of the concept of donor milk (outcome variable) were analyzed and reported in percentages. The Chi-square analysis was used to assess initial associations between the predictor and outcome variables. Binary logistic regression analysis was used to determine sociodemographic characteristics of respondents that predicted willingness to donate breast milk or receive donated breast milk among respondents. Measures of this association was presented as odd ratios (OR) and 95% confidence intervals (95% CI). Data analysis was done using IBM® SPSS version 21 (SPSS Inc., Chicago, IL) and statistical significance was set at p < 0.05. Respondents with grossly missing information were excluded from the data analysis. A total of one thousand five hundred (1500) questionnaires were administered through self and/or interviewer-based administration depending on the respondents’ abilities. Of these, two hundred and sixty-five respondents had grossly missing information and were excluded from the data analysis. One thousand two hundred and thirty-five women (1235) were successfully enrolled giving a response rate of 82.3% (Figure 1). Table 2 shows the characteristics of respondents. Approximately 40% were each within the 20–29 and 30–39-years age bracket. Another six and 11% were less than 20 and ≥ 40 years respectively. The mean age of the respondents in this study was 31.1 ± 7.3 and 38.9 ± 7.6 for their spouses. The majority (63%) of the mothers had a post-secondary school education and 68% were within the high socio-economic class. About a quarter of the study participants were unemployed and the remaining three quarters were employed in an unskilled (23%), semi-skilled (35%) and skilled (17%) occupational category. Almost all respondents (98%) were Christians and from the Igbo tribe (94%). Ninety-five percent were in a marital relationship and the other 5% were single i.e. never married, divorced or widowed. Five hundred and fourteen study participants (45%) said they usually experience excessive breast milk flow during lactation. Seven hundred and seven (60%) respondents expressed willingness to receive donated breast milk if the need arises while the remaining 465 (40%) would prefer not to receive breast milk. Among the latter group, 195/465 (43%) would receive donated breast milk if the donor is well screened and deemed safe. A hundred and fifty of them (13%) will desire financial remuneration to donate while 885 (80%) will require spousal consent to either donate or receive breast milk in case of need. A significant proportion of those who require spousal consent were more educated (postsecondary 84% vs. secondary 76% vs. primary 67%, p = 0.001), of higher socio-economic class (high 83% vs. middle 76% and low 71%, p = 0.003) and in the lower occupational category (unemployed 87% vs. unskilled 72% vs. semi-skilled 81% and skilled 82%, p = 0.001). Almost all respondents 1199 (98%) believed breast milk was the best feed for the newborns. The most common reasons for this belief was that breast milk was nutritionally superior to infant formula 829/3669 (23%) and protective against disease 797/3669 (22%). Others included affordability (14%), convenience (12%), warmth (10%), bonding (12%) and other unspecified reasons (7%). Based on these reasons, 587 (50%) of the respondents supposed they would recommend donated breast milk to other mothers who may need it. Five hundred and fifty-five respondents (55%) would prefer donated breast milk to infant formula if there is a medical condition that prevents the use of their own milk and about 9 in 10 of the respondents would prefer the donation of breast milk to be from a relative. See Table 3. Finally, respondents who expressed unwillingness to donate breast milk or use donor milk were asked to give reasons for their perceived belief for and against the use of donor milk. Table 4 shows summarizes some of the reason given by the respondents. Of the maternal sociodemographic characteristics considered in the study, age of respondents, religion, tribe of origin and marital status were significantly associated with being aware of the policy on breast milk donation. Mothers that were older (≥ 40 yrs. 13%, 30–39 yrs. 7%, 20–29 yrs. 5% and < 20 yrs. 7%; p = 0.008), non-Christians (Christian 6%, vs. other religion 22%; p = 0.001), non-Igbos (Igbos 6%, Hausas 21%, Yorubas 20%, others 19%; p = 0.001) and those unmarried (28% vs. 6%; p = 0.001) were more aware of policies related to breast milk donation. Furthermore, only respondent’s age and occupational status was significantly associated with adequate knowledge of donor milk (Table 3). More respondents below the age of 20 years (19%) had adequate knowledge of the concept compared to those in other age categories (≥ 40 yrs. 8%, 30–39 yrs. 9%, and 20–29 yrs. 12%; p = 0.049), educational attainment (post-secondary 42%, secondary 31% and primary 45%; p = 0.001), occupational status (unemployed 31%, unskilled 31%, semi-skilled 48% and skilled 44%; p = 0.0010). Finally, more respondents with lower educational attainment, primary (27%) would require financial inducement to donate breast milk compared to those with secondary (15%) and postsecondary (11%) education; p = 0.002. Similarly, non-Christians (26%) were 2.4 times more likely to require financial inducement before donating breast milk than Christian (13%); p = 0.004]. See Table 5. Tables 5 and 6 show cross-tabulation of maternal factors associated with willingness to donate breast milk or accept donated milk. Maternal education (p = 0.001), occupational strata (p = 0.004), knowledge of the concept of donor milk (p = 0.001), awareness of government policies (p = 0.001), seeking financial remuneration (p = 0.001) and spousal consent to donate/receive donated milk (p = 0.001) were significantly associated with willingness of respondents to donate and/or receive donated milk. Others include preference for donor (p = 0.001), donor tested and safe (p = 0.001), and milk preference in serious medical condition (p = 0.001). Table 7 shows the multivariable logistic regression analysis of maternal characteristics and their willingness to donate or receive donated breast milk. After adjusting for other maternal variables of interest, only having knowledge of the concept of donor milk (p = 0.001), seeking financial remuneration (p = 0.001) and milk preference in serious medical condition (p = 0.001) retained significance as determinants of willingness to donate or accept donated breast milk among respondents (Table 7). Respondents with adequate knowledge of the concept of donor milk were about 10.8 times OR 10.76, CI 2.78, 23.67; (p = 0.001) while those with partial knowledge were 3.41 times OR 3.41, CI 0.98, 11.84; (p = 0.054) more likely to donate breast milk or accept donated breast milk for their newborns. Similarly, respondents that indicated financial remuneration as perquisite for breast milk donation were 0.18 less likely to donate their breast milk compared to those that would donate without charge OR 0.18, CI 0.10, 0.44; (p = 0.001). In other words, respondents willing to donate without financial incentives were about 5.5 times more likely to donate their breast milk compared to those that require financial remuneration to donate. Lastly, it was noted that in serious medical conditions where respondents cannot breastfeed their babies or situations where their breast milk is contraindicated, those that prefer donor milk to infant formula were 6.64 times more willing to donate their breast milk or receive donor milk than those that prefer infant formula in such conditions (OR 6.64, CI 2.87, 15.36; p = 0.001). This study reports a low knowledge of the concept donor breast milk and low awareness of policy regarding the use of Donor Breast Milk (DBM) in Nigeria but a relatively high willingness of mother to participate in the concept. This finding is similar to the results of a comparable survey on 198 mothers in a tertiary hospital in south-south Nigeria which showed that only 25.8% have heard about the concept of DBM but 59.1% strongly believed that human milk banking is necessary to assist orphaned and abandoned babies . Another study that surveyed 448 mothers in Izmir, Turkey also showed that even though only 41.6% were aware of the concept of milk banking, 71.3% were willing to receive milk bank services and 68.8% were willing to donate their breastmilk . Correspondingly, it was noted in our study that the most common source of information about donor breast milk was from healthcare workers which is identical to the 46.1% reported in another study in south-south Nigeria . These is however contrarily to the finding of the study in Turkey where the media accounted for 85.7% of the information source of DBM among respondents. These differences may be related to the better availability of electronic media to mothers in Turkey where for instance 46% of women have access to internet and other electronic media compared to 28% in Nigeria [15, 16]. Like this study, the studies in Benin and Izmir showed a major concern about infection transmission was the common reason mothers were unwilling to accept donated breast milk for their babies [13, 14]. The authors of these studies specifically reported that 59.1% and 62.2% of surveyed mothers in Benin and Izmir respectively, were unwilling to receive donated breast milk stating the risk of contracting infections as a major concern. As noted in our study, the number of mothers who expressed unwillingness to use donor breast milk significantly reduced when they were assured that donor will be screened and tested for transmittable infections. This further strengthens the need for proper enlightenment of mothers and their families about the processes involved in the concept of human breast milk banking. In the same vein, our study showed that less than a tenth of respondents mentioned religion as a concern for their unwillingness to donate or receive donated breast milk, unlike in the Turkey study where a sizable proportion of mothers surveyed expressed religion as a barrier to acceptability of the concept of DBM . To reduce or completely eradicate the distracting influence of religion on the well documented benefit of breast milk, relevant government authorities needs to involve faith and religious leaders in the campaign for DBM in order to eliminate religious prejudices and increase the acceptability of the concept. Other reasons for unwillingness to receive donor breast milk documented in our study includes cultural unacceptability, unhygienic preparation, societal stigma, generally unacceptability, fear of transmission of bad genetic traits etc. These are realistic and honest concerns that can be allayed through targeted enlightenment programs and sharing of real-life success stories. Due to the setting where this study was conducted, it is worth mentioning that the willingness to donate or receive donor breast milk was significantly associated with spousal consent even though the association lost significance on adjusted logistic regression analysis. Several studies in Nigeria and other developing countries have reported that most women seek permission from their spouse for use of health-related facilities [17–19]. The need for consent by women from their spouses for health-related matters in most developing settings is an unfortunate but unsurprising fact in a patriarch society like Nigeria where polygamy is common and women are usually dependent on their spouse for most decisions due to inequalities in income and age. To the best of authors knowledge, no study has specifically investigated the association between willingness to donate/receive donor breast milk and spouse consent in a developing setting. We found that knowledge of the donor breast milk concept, not being interested in financial compensation for donating breast milk and preference of donor breast milk over infant formulas were predictive of the mothers that would be potential breast milk donors. This is in line with the findings from a similar multi-center study in eastern Ethiopia which showed that acceptance of donor milk banking was more likely among mothers who had heard about donor milk banking and wet-nurses . Another study in Rio de Janeiro, Brazil found that enhancing the understanding of the donor breast milk concept through encouragement by healthcare professionals, relatives, or friends, receiving information on breast milk expression by the primary health care unit, and receiving help from the unit professionals to breastfeed were associated with a higher prevalence of breast milk donation . These findings are hardly surprising as conceptual understanding of a program or concept causes acceptance and participation where appropriate. Furthermore, our study noted that mothers without monetary motives were more willing to donate their breast milk compared to those that require financial remuneration. Fortunately, only a small proportion of mothers in our survey indicated interest in monetary compensation before donating their breast milk. This is particularly not unexpected in a developing country like Nigeria where people donate their blood for financial gains  and where, over 65% women live in extreme poverty . Financial remuneration for breast milk donation has been the subject of continuing research which has produced some conflicting results. Nonetheless, the Human Milk Banking Association of North America (HMBANA) endorses non- profit donor milk banking to ensure that a valuable healthcare resource is allocated in an ethical and safe manner, keeping the safety and needs of the recipient and donor paramount . In addition, HMBANA has identified several problems associated with introducing the profit motive to milk banks. These includes adulterating milk to increase volume and placing the infant of the lactating mother at risk if she feels pressure to provide a certain volume of milk to a bank or a recipient rather than feeding her own infant . Bloom noted in a study that adulteration of milk for financial gain led to rejection of 73 out of 4935 breast milk donations and that the dilution rejection rate was significantly higher in donors that required financial remuneration . Also, Keim et al. reported that in 102 purchased samples advertised online as breast milk, eleven contained bovine DNA and ten of these had a level of bovine DNA consistent with human milk mixed with at least 10% cow’s milk . Finally, we reported that mothers who would prefer donor breast milk over infant formula for their newborns in situations where they cannot breast their own babies were more likely to donate their breast milk compared to those that favored infant formulas. It is reasonable to assume that mothers that prefer donor breast milk over infant formula would most probably have reasonable knowledge of the social, economic and health benefits of breast milk and would naturally be more willing to donate their own breast milk for mothers and infants in need. The World Health Organization recommends donor breast milk as the next preferred option in situations where women are not able to provide their infants with enough amounts of their own breast milk . Unfortunately, developing countries lag the rest of the world in establishing and promoting human milk banks. As a matter of fact, there is currently no functional human milk bank in the whole of the West African sub-region . Firstly, the cross-sectional design of this study makes it difficult to establish causal temporal relationships between the predictor (sociodemographic parameters of mothers) and outcome (willingness to donate or receive donor breast milk) variables considered in this study. Secondly, because only mothers were enrolled in our study, the views of health professionals, policy makers, community leaders and other stakeholders in the breast milk banking service were left out thus eliminating an important source of data regarding this concept. Finally, some inaccurate information from respondents might have resulted in misclassification of variables and subsequent misinterpretation of study conclusions. The authors therefore recommend that the findings of this study be interpreted in the light of these limitations. In conclusion, our study found that the knowledge of the concept of donor breast milk and awareness of policies recommending its practice in Nigeria is low, but the prospect of its acceptability is high among mothers surveyed in south-east Nigeria. Targeted public enlightenment and education to mothers and their families by relevant government agencies in collaboration with clinicians, community and religious leaders about the concept of donor breast milk may help increase the acceptance and practice of donating breast milk and/or use of donated breast milk among mothers in the region. The authors wish to thank all management of the centres were the study was conducted. We also appreciate the efforts of the specialist registrars that assisted in data collection during their clinical posting in the Paediatric department of the respective teaching hospitals. We are also grateful to the highly dedicated staff nurses in the unit for their tireless efforts in some study related documentations. IKK conceptualized the study, developed the methodology and contributed to writing the manuscript. ODIC did the statistical data analysis of study, wrote the background, result and discussion section of the work and contributed in drafting the methodology. NIK was involved in data collection, contributed in writing the discussion and drafting the text of the manuscript. AIN, ONI, ECC, UMO, AO, EU, OCC, ACA and OUH were involved in supervision, data collection and reviewed the final draft of the manuscript. All authors read and approved the final manuscript. Ethical approval was obtained from the Ethics and Research Committee of the Enugu State University Teaching Hospital (ESUTHP/C-MAC/RA/034/066). Informed consent was obtained from the parents of the children. The retrieved information was transferred into a private computer and pass worded. Hard copies of answered questionnaires was securely be locked in a private locker and destroyed after the study. Data was anonymized, and questionnaires had no names and was serially labelled. Participation in the study was entirely voluntary, and no financial inducement whatsoever was involved. Participants were informed that voluntary withdrawal at any stage of interaction was guaranteed for them without any adverse effect to the mother or their baby. World Health Organization. Global targets 2025. To improve maternal, infant and young child Nutrition Available and assessed on 30/9/2018 from www.who.int/nutrition/topics/nutrition_globaltargets2025/en/. United Nations Children’s Fund (UNICEF). Strategic Guidance Note on the Newborn Provisional Version, May 2006, New York, 2006. Available and assessed on 30/9/2018 from http://lifesavingcommodities.org/wp-content/uploads/2015/04/Strategic-Guidance-Note-on-the-Newbron.pdf. NICE Clinical Guidelines. Donor Breast Milk Banks: The Operation of Donor Milk Bank Services. Centre for Clinical Practice at NICE London, 2006. Available and assessed on 9/82018 from https://www.ncbi.nlm.nih.gov/books/NBK66147/. UNICEF Nigeria. More than 5 million Nigerian newborns miss out on head start in life. Media Center 2016. Source: https://www.unicef.org/nigeria/media_10520.html. Federal Ministry of Health, Department of Family Health Abuja, National Policy on Infant and Young Child Feeding in Nigeria. November 2010. Available and assessed on 12/8/2017 from http://health.gov.ng/doc/IYCFPolicy.pdf. Women's Learning Partnership (WLP). Statistics on Turkey. Available and assessed on 13/8/2018 from http://www.learningpartnership.org/turkey. Women's Learning Partnership (WLP). Statistics on Nigeria. Available and assessed on 13/8/2018 from http://www.learningpartnership.org/nigeria. The Human Milk Banking Association of North America (HMBANA). Donor human milk: ensuring safety and ethical allocation. Available and assessed on 13/8/2018 from https://www.hmbana.org/.